There are two types of the file rules: exclusion rules and rules for renaming. To edit the rules select the Project / FileRules... main menu item. The rules are saved in a project file. So each project has its own file rules. The exclusion rules exclude files with names that match defined patterns from synchronization. The pattern is a file name, which can contain special characters: ? and *. The ? character replaces any single character. For example, the test?.txt pattern matches files with names testA.txt and testB.txt, and does not match files with names test.txt and testCC.txt. The * character replaces any number of any characters, including no characters. For example, the test*.txt pattern matches files with names testA.txt, testB.txt, test.txt and testCC.txt, and does not match files with names tes.txt and testCCtxt. The pattern can contain a few characters ? and * at once. Example. Suppose you edit website source files in an editor. When the editor writes a file to a disk it renames a previous file to a file with the .bak extension. If you do not want those backup files were on a production server, you simply enter the *.bak exclusion rule. After that, files with the .bak extension will not be loaded to the FTP server. Files excluded by exclusion rules are marked with the special icon . The rules for renaming files consist of two patterns: a comparison pattern and a new name pattern. These patterns are similar to patterns in the exclusion rules. If a name of a file matches the comparison pattern, the file will be renamed by the new name pattern when the file is transferred to an FTP server. Example. Suppose, your local web server requires some settings in the .htaccess file, but a production server requires other settings. You want to keep and edit both versions of the settings. The easiest way to do it, is by the rules for renaming. 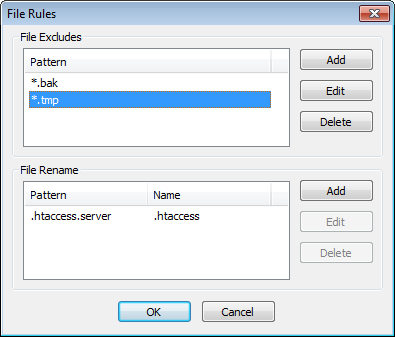 You keep the settings of the local web server in the .htaccess file, and the settings of the production web server in the .htaccess.server file. You set up the .htaccess.server -> .htaccess rule. If you have a lot of same configuration files with different names, you can create the *.server -> * rule. If you publish a website on different servers with different settings, then you can keep the settings in files with extensions .server1, .server2 etc. Then you can create many projects, and in each project you can set up the rule like *.server1 -> *, *.server2 -> * etc.